Anti-allergenic, relaxing and soothing. 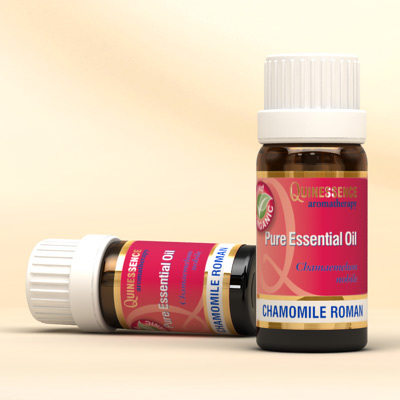 Derived from one of the oldest of all known medicinal herbs, organic Roman Chamomile Essential Oil has a sweet herbaceous aroma with fruity, apple-like overtones that are reminiscent of chamomile tea. Inhaling its wonderful aroma helps to calm agitated nerves, stress and states of nervousness, and adding a few drops of this oil in a diffuser is perfect for calming down noisy children, angry partners, and your frazzled nerves! Hot, itchy, and irritated skin conditions respond extremely well to organic Roman Chamomile Oil, but when using it for eczema or psoriasis use it in a lotion or cream base rather than a carrier oil which can sometimes aggravate these conditions. Recent studies have found that this oil is a powerful antioxidant, so when added to your in skincare treatments it can help to neutralize the free radicals responsible for damaging the DNA of your skin. When you have trouble sleeping, simply add a few drops of organic Roman Chamomile Essential Oil to a warm bath or use it in a relaxing massage before retiring to bed. When inhaled from a tissue it soothes irritated and inflamed nasal passages and brings welcome relief to hay fever and allergic rhinitis sufferers due to its anti-allergen effect. These properties are also extremely useful for calming and soothing the airways for those with asthma too. Many older aromatherapy and botanical books refer to the botanical name of Roman chamomile as Anthemis nobilis, but more recently botanical texts refer to this plant as Chamaemelum nobile. Don’t be confused by this since both names are correct and do refer to the same plant. Isobutyl angelate, Isoamyl angelate, Methylallyl angelate, 2-Methylbutyl-angelate, Isoamyl methacrylate, trans-Pinocarveol, Pinocarvone.